Dexamethasone is a widely used drug in medical and biological applications. Since the systematic and controllable release of this drug is of significant importance, encapsulation of this anti-inflammatory drug in poly(lactic-co-glycolic acid) (PLGA) nanoparticles can minimize uncontrolled issues. As dexamethasone-encapsulated PLGA nanoparticles are synthesized in the presence of organic solvents, poly(dimethylsiloxane) (PDMS)-based microchannels collapse due to the swelling problem. In present study, PTFE nanoparticles were used for the surface modification of the microchannels to prevent absorption and adhesion of solvents into the microchannels’ wall. The contact angle analysis of microchips after coating showed that the surface of microchannels bear the superhydrophobicity feature (140.30°) and SEM images revealed that PTFE covered the surface of PDMS, favorably. Then, the prepared microchip was tested for the synthesis of dexamethasone-loaded nanoparticles. SEM and atomic force microscopy (AFM) images of the synthesized nanoparticles represented that there was not any evidence of adhesion or absorption of nanoparticles. Furthermore, the monodispersity of nanoparticles was discernible. As AFM results revealed, the average diameters of 47, 63, and 82 nm were achieved for flow ratios of 0.01, 0.05, and 0.1, respectively. 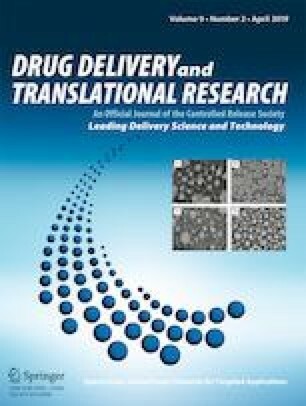 To evaluate the drug efficiency, cumulative release and encapsulation efficiency were analyzed which showed much more efficiency than the synthesized nanoparticles in the bulk mode. In addition, MTT test revealed that nanoparticles could be considered as a non-toxic material. Since the synthesis of drug-loaded nanoparticles is ubiquitous in laboratory experiments, the approach presented in this study can render more versatility in this regard. The online version of this article ( https://doi.org/10.1007/s13346-019-00636-z) contains supplementary material, which is available to authorized users.